Interested in learning first-hand about birch tapping and syrup production? Moose Meadows Farm is proud of its efforts towards assisting with the establishment of a viable and active birch syrup industry in Canada. In 2007, Heloise authored the first and only manual on birch syrup production in Canada (The Birch Syrup Production Manual – Tapping into Syrup Boreal Forest Style) and was the recipient of the first Award of Excellence in Innovation in Agriculture & Agri-Foods for her efforts. Contact the farm and enquire about our 1 day workshops and consultation opportunities. To date, these workshops have been held in Quesnel, Fort St.James, Prince George and Hazelton. 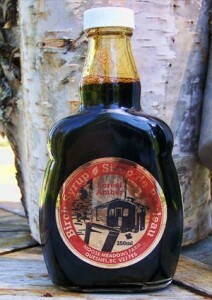 A little bit of our syrup goes a long way… we’ve sent it from coast to coast! Located on West Fourth Avenue in downtown Vancouver, Bishop’s specialises in western cuisine, with an emphasis on fresh, regional produce.